Despite worse than expected same store sales McDonald's is up 3.4%. Read on to find out why. The Dow Jones Industrial Average (DJINDICES:^DJI) was relatively unchanged, down 58 points, to 16,360, as of 1:30 p.m. EDT on a slow day for the market. The S&P 500 (SNPINDEX:^GSPC) was down seven points to 1,869. Leading the Dow Jones today is McDonald's (NYSE:MCD), which was up 3.3% to $98.33, even after the fast-food giant yesterday reported weaker than expected sales numbers for February. Global same-store sales were down 0.3% at locations open for at least 13 months. That fall was led by the Middle East, Africa, and Asia/Pacific, where same-store sales dropped 2.6%. In the U.S. same-store sales were down 1.4%. Europe was McDonald's bright spot with same-store sales up 0.6%. CFO Pete Bensen said the company is "actively looking at ways to optimize our capital structure, while maintaining our long-term financial strength." He added that the company could add more debt-to-return value to shareholders through increased buybacks, along with capital to shareholders through an increased dividend. McDonald's has previously said it aims to return $5 billion to shareholders through buybacks and dividends. As results have been slowly improving the company has increased its dividends to return capital to shareholders. 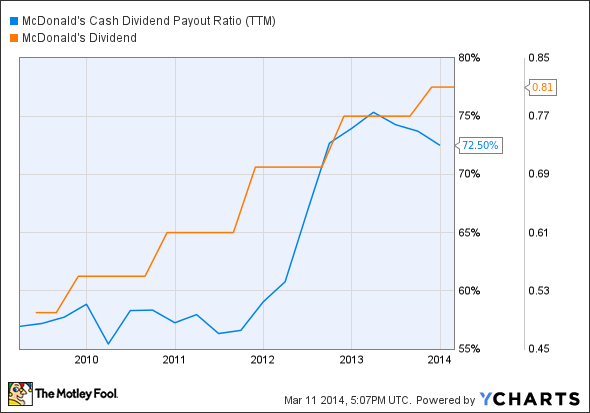 MCD Cash Dividend Payout Ratio (TTM) data by YCharts. With a cash payout ratio of roughly 70%, McDonald's has some room to increase its dividend. Taking on debt to fund buybacks can be a good strategy to return value to shareholders, but only if the company is buying back shares for less than their value. Too often, companies buy back shares at high prices and then stop buybacks as prices decline. The classic "buy high, sell low" strategy of terrible investors. In the meantime, though, buyers of McDonald's stock are paying 17 times trailing earnings and getting a 3.4% dividend yield. Not a terrible opportunity in this overvalued market.